Ralph McCloud on the Edmund Pettus Bridge in Selma, Alabama during celebrations to mark the 50th anniversary of the Selma to Montgomery Marches. 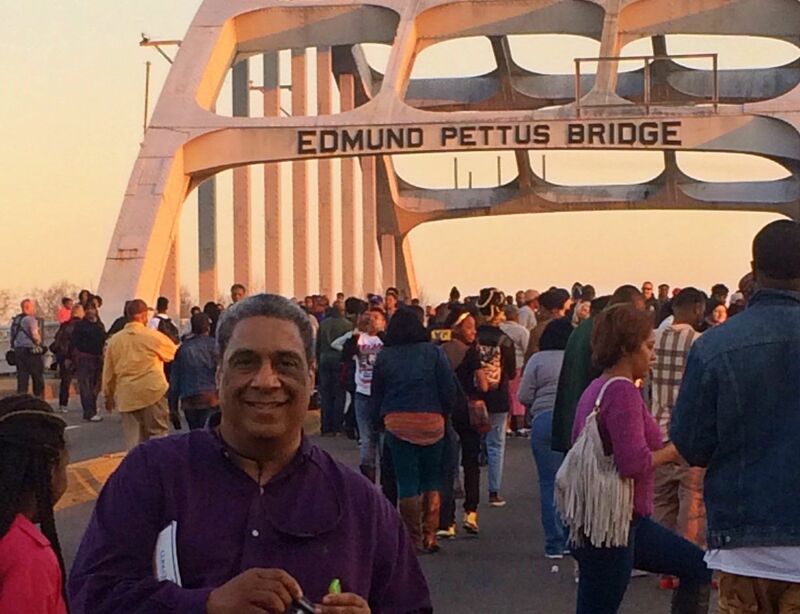 Like tens of thousands of others, I went to Selma to recall a historic struggle. A struggle that continues today for those who refuse to bow down to bigotry and hatred. Thousands came to re-enact an act of public defiance to laws and impediments that denied them full citizenship. I went at the invitation of colleagues and friends, but I must admit I felt a profound curiosity. I had learned about the civil rights struggle; I had seen the movies, heard the songs. But I felt called to go, for two reasons. First, I wanted to honor the historic value of the Selma March; what it has meant over the last 50 years. Second, and most importantly, I went because of what it can mean for our future. Ambling across the historic Edmund Pettus Bridge, I played a mental game of “Ping-Pong”. “Pinging,” my thoughts honored with gratitude the six hundred brave souls who courageously walked the same journey 50 years prior. They had no way of knowing what awaited them some 54 miles and 50 years later. I sensed a growing appreciation for that time in our history when a door was opened to change, not just in the United States but worldwide. Then my mind “ponged” back to the present, to the recent Department of Justice report on police misconduct in Ferguson, MO. I remembered the high rate of child poverty in our country—1 in 3 children live in poverty—and even worse for communities of color. I recalled the lingering abject poverty I had just seen that very morning during a tour of modern day Selma. 40% of Selma residents live in poverty. I thought of the high incarceration rate of black and brown people, subjected to unjust sentencing guidelines, living without hope. Then I “pinged” again as I recalled “Neek,” a man I met who had journeyed on the Selma March 50 years ago when he was just 13. He and his best friend were given permission by their parents to march in a demonstration that was both unsafe and uncertain. Their parents wanted to go, but feared losing their jobs if they were identified as being part of the “movement”. I “ponged” again, amazed that those parents still organized, planned and sacrificed, knowing they could be fired anyway if it was discovered that their children had participated. I was inspired as I heard Thomas Rodi, Archbishop of Mobile, preach at a Mass concelebrated by three African American bishops; Bishop John Ricard SSJ, Bishop Sheldon Fabre and Bishop Martin Holly. Archbishop Rodi spoke of the Catholic Church’s outsized historic role in the Civil Rights Movement. He spoke of Catholics participating in the Selma to Montgomery March, not just as walkers, but in healing and housing. Catholics healed the beaten, bitten and bruised at Good Samaritan Hospital (appropriately named), the only hospital that would see African American patients. Catholics housed, giving folk respite and lodging at the City of St. Jude organization (also appropriately named), which welcomed sojourners arriving in Montgomery. I looked around at the enormous crowd, young and beautifully diverse. We would take a few steps and stop, a few more steps and stop. I thought of what it must have been like… to be battered by clubs, bitten by dogs, disrespected by police officers and onlookers. I could not help but wonder if I would have had the mettle and courage to do this 50 years ago. I came to no conclusions, but I was convinced that my parents and ancestors would have definitely walked, despite the danger, fear and uncertainty. Then the march stopped suddenly; the end of the bridge was still a long ways off. We all began to wonder what was going on. The folk at the head of the march realized that it would be impossible to continue because of the huge number of people gathered. They passed word back, which spread quickly among us along with no small disappointment. But there was a symbolism to it… the march is not yet finished. The march toward justice continues. We who seek justice must not be content with merely making it to the other side of the bridge, or even getting all the way to Montgomery. We must not stop our stride toward freedom until justice surges like waters, and righteousness like an unfailing stream. Ralph McCloud is director of the USCCB Catholic Campaign for Human Development. Your reflection is wonderful! I wonder how things will go in Montgomery next week. Certainly, the march continues even beyond our individual efforts.